It’s no secret that Brampton’s schools are practically bursting at the seams as the city’s population continues to grow at three times the national average. 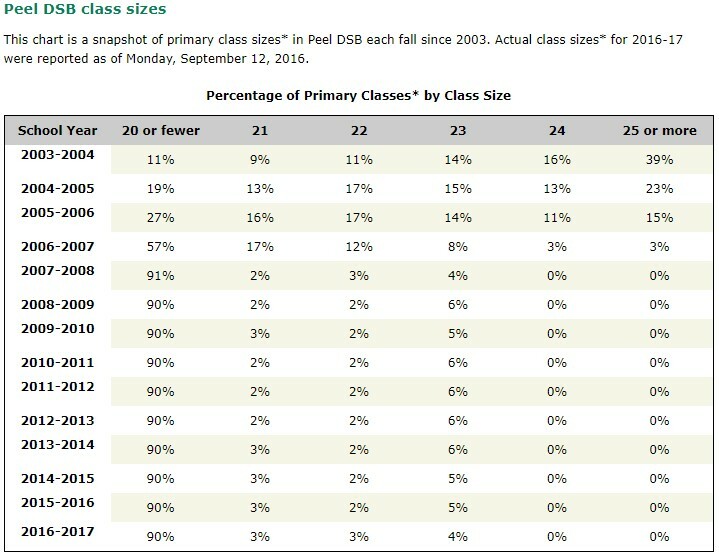 Now, a provincial review of the education system could see class sizes, which are currently capped, getting even bigger. Announced on Jan. 23 by Education Minister Lisa Thompson, the Ministry of Education plans to hold consultations on several issues, including career mobility for teachers, teacher interview guidelines during the hiring process, and of course, class sizes. Media reports have suggested the government is looking at removing class size caps for kindergarten classes and Grades 1 to 3. Currently, the cap for kindergarten is set at 29, from Grades 1 to 3 the cap is 20 and the rest of the primary grades are capped at 23 students. Previous Ontario governments, under the Liberals, introduced a target to invest in education so that 90% of the province’s primary classes have 20 students or less. That goal was reached in 2008-09. Investments were made so boards could hire 5,000 additional primary teachers, while the Liberals oversaw the construction or renovation of about 2,000 classrooms to reach targets for smaller class sizes. 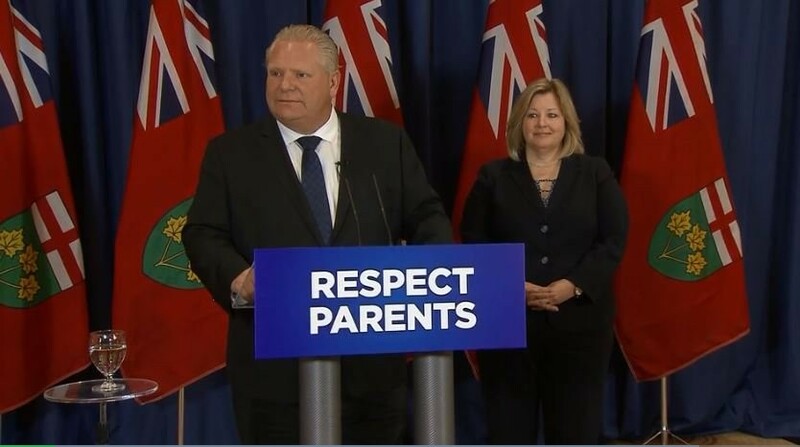 The Doug Ford government’s announcement this week could lead to the lifting of caps on class sizes, which would save money, but experts say it would directly impact student and teacher performance. In 2017, the previous government began a funding strategy to reduce class sizes from Grades 4-8, with a target to get every board in the province at an average class size of 24.5 or lower within 5 years. But the PC government’s move to review removing caps on class size, could undo all of that. “We are modernizing the way we fund education in a responsible manner and we are eager to hear the innovative ideas of educators and sector partners,” Thompson said in a released statement. The announcement appears to have come as a surprise to the Peel District School Board, which was unaware of the reasons behind the new consultation. “We do not have that context,” said Ryan Reyes, the board’s manager of communications and community relations. In Brampton, a series of factors have ballooned the number of students in local schools. Along with a rapid growth in population, need projections may not take into account children living in unregistered secondary suites, also called basement apartments. Brampton has one of the highest average rates of school-age children per household in the province, largely because of families living in secondary suites which planners cannot predict when trying to align the number of building permits with capacity in neighbourhood schools. 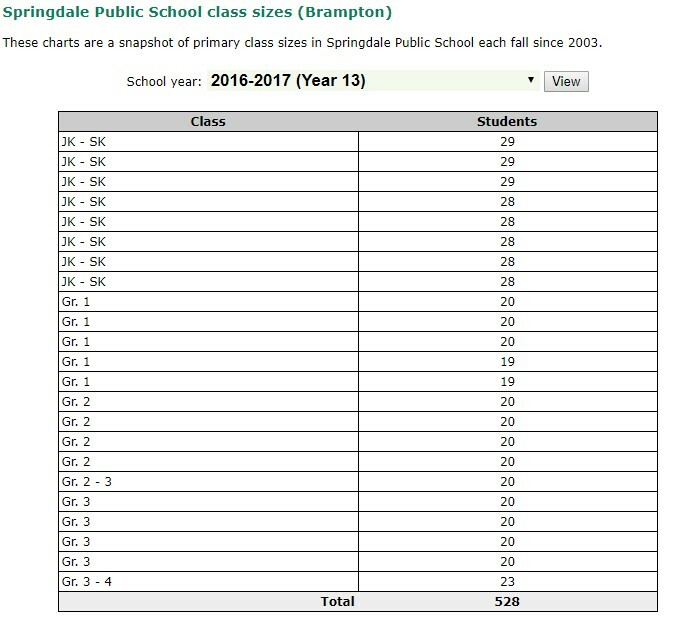 The chart below shows class sizes, after provincial caps were introduced by previous Liberal governments, at one Brampton elementary school, Springdale Public School, in the 2016-17 school year. In Brampton, the city’s rate of population increase has not been matched by additional classrooms and schools to keep up with the booming growth, which is about three times the national average. In 2013 Peel’s largest public board needed funding for eight new schools, but the Liberal government at the time only invested in three new schools, despite the board’s request for more than twice what it was given. That decision was made while the Liberals had a plan to reduce class sizes, as part of the promises it had made to voters. The result is usually portable classrooms to meet the province’s hard caps. It’s not uncommon for Brampton schools to have more than a dozen portables located outside a school’s main building, which creates a different set of challenges for educators. Peel’s public and Catholic boards are now using better planning predictors to estimate the demand local schools will have to accommodate, but this has led to the increase in the number of portables the board has had to fund. Parrish is wary of Premier Doug Ford’s motivations for the consultations. As he hunts for ways to save money, it’s a slim chance he’s looking to reduce the size of classes, though smaller classes have known benefits to young students. Dropping the cap on class size may only exacerbate problems that have been simmering in the Peel board for several years. A 2014 report to the board showed that 36 percent of kindergarten classes would have more than 26 students going into the 2015/2016 school year. Approximately 35 percent of those classes were expected to have 27 to 29 students, and one percent could contain 30 or more kids.